With optional integrated motion sensor, ideal luminaire for stairwell applications. 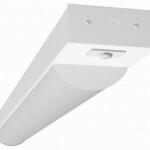 Low glare luminaire for wide range of applications such as ambient lighting, stairwells, restrooms, corridors, and other areas requiring a high quality, efficient fixture. Can be surface or chain mounted individually or in continuous row. Lumen packages from 1,900 – 10,000 lumens.